October 2014 Community Round-up – Zombies, Run! It’s that time again! Time to see what the Zombies, Run! community has been cooking up. We’ve got another packed edition of the community round-up this month, no doubt spurred on by the epic conclusion to Season 3. You’ve outdone yourselves! Fawndolyn Valentine who, apart from having an incredible name, runs website HoneyInMyGears.com, has sent us this great piece of university coursework. It’s a comic based on Season One episode nine of Zombies, Run! : A Voice In The Dark. If you like what you see from the snippet above, make sure you check out the rest of the comic over at Fawndolyn’s website. It’s a great take on the episode, showing Runner 5’s inner monologue during the iconic Season One run. We’ve all been there. The fanart keeps coming in! 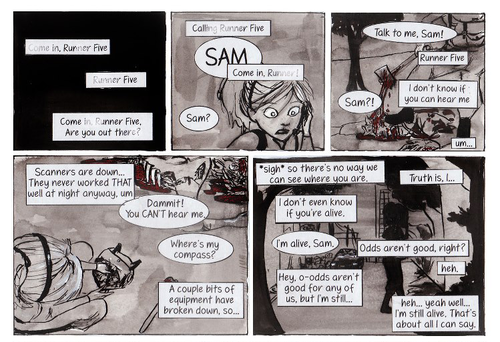 Here we have Anna Lundstrom’s (StopFailing on Deviantart) great take on Runner 5. A nice colourful outfit helps you forget you’re living in a zombie apocalypse. Until you get home to the barbed wire fence and start washing the blood and guts from your clothes. Still, until then it’s a beautiful dream. Back to the Tumblr mines now, with an awesome picture by Coyotewhispers. 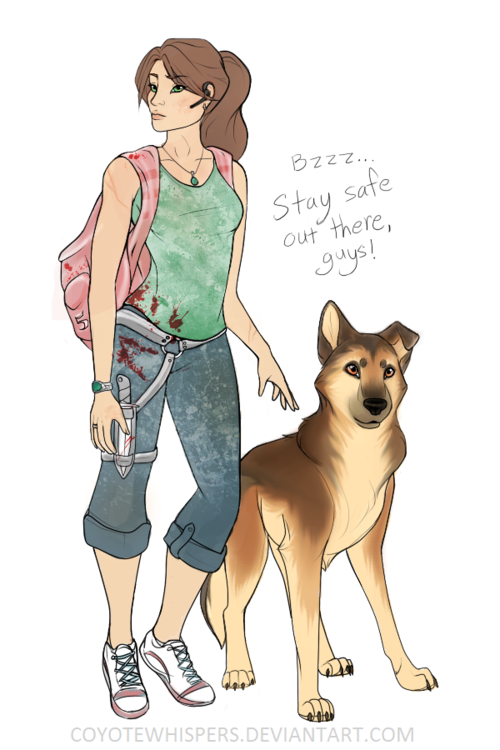 Not only does Runner 5 have a hint of Lara Croft about her, but she’s joined by a super fuzzy dog friend. Or perhaps it’s the dog who is the true Runner 5… Four legs would certainly make avoiding zombies a lot easier. From a canine to a feline, Runner 5s come in all shapes and sizes. 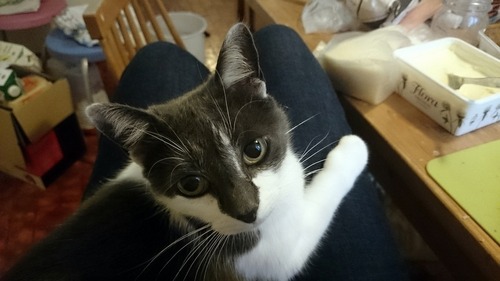 This cat, owned by Tumblr user WitchAryllia, became possibly the littlest member of Able Township when she joined her owner on her Zombies, Run! mission. We’re happy to see that the game is being used not just to exercise humans, but their pets too. Zombies, Run! is nothing if not an equal opportunity app. 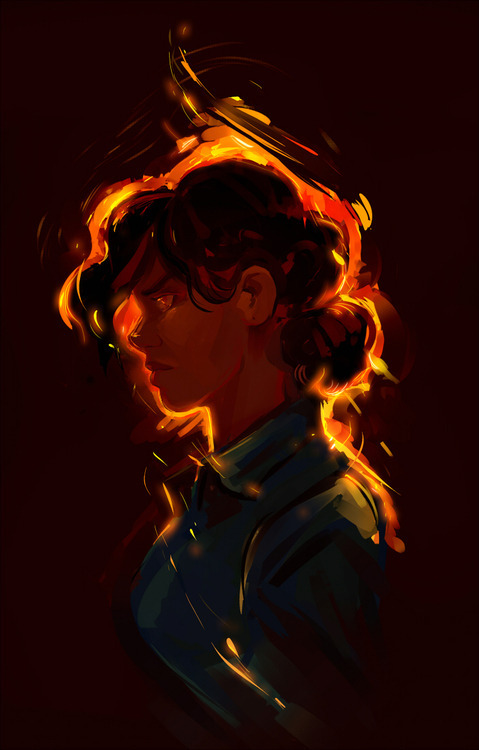 We started with a comic depicting the events of A Voice In The Dark, and here we have a piece of fanart by Tumblr user Kalimak which shows the events that took place just before. 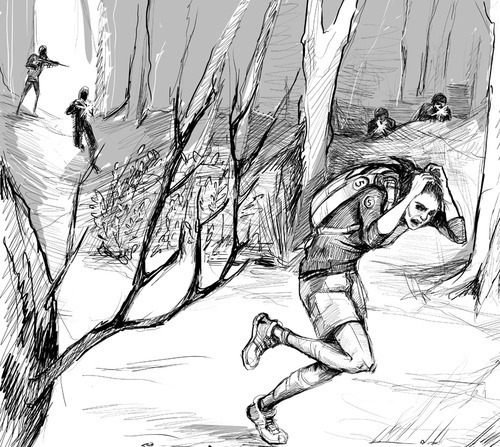 “Take Evasive Manoeuvres” shows the ambush of Runner 5 during episode eight of Season One, drawn in a great sketchy black and white style. We love it! It wouldn’t be a Zombies, Run! community round-up without a piece by TheWondersmith. Here we see a portrait of Janine and her gold aura. It’s stunning work, as always. Looks like something you’d expect to see on a propaganda poster. “Able Needs YOU” style. Great stuff. 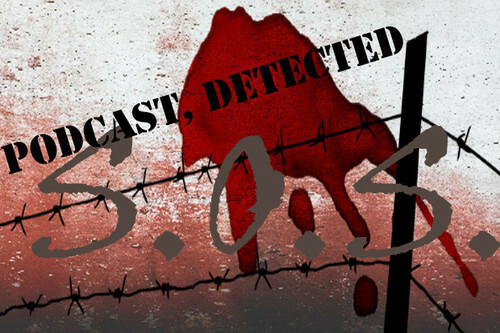 Finally we return to Podcast Detected, the fan-run Zombies, Run! podcast. We featured them on the community round-up a few months back and now they’re looking for some help in order for the project to survive. 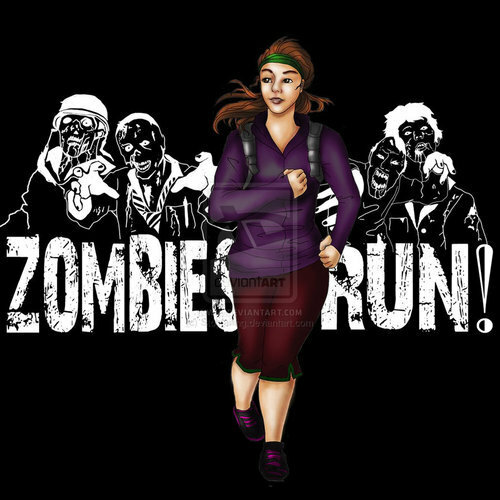 So check out the Indiegogo page and see if you can donate a little bit of money to keep your favourite Zombies, Run! podcast on the air. Thankfully it seems the team has enough already to continue for a while, but giving more will mean more stretch goal prizes for the community! As always, if you have something you’d like to submit for the community round-up, make sure you send it over to Jem@Sixtostart.com. We’re looking forward to seeing your submissions! Next Post Half-Price Halloween Sale!